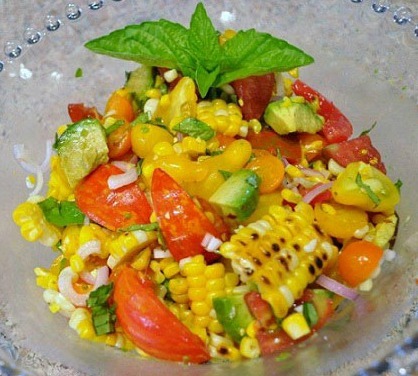 Grilled Corn Salad with tomato, and avocado is absolutely fantastic, especially if you source the corn, tomatoes, and sweet basil from your garden or from your local Farmer’s Market. The beautiful colors and flavors of freshly-grilled corn, avocados and tomatoes meld together for this wonderful summer grilled corn salad that is so refreshing. You love the combination of fresh flavors this salad offer you. The dressing is delicious and the salad is filled with great textures and flavors that is sweet and crunchy. I will make this dish over and over again. It is the perfect summer dish to serve your family or friends. I always get rave reviews whenever I serve it. This recipe is a definite keeper! This delicious fresh Grilled Corn Salad recipe and photos were shared with my by Karen Calanchini, Food Stylist and Photographer, of Redding, CA. * Fully ripe sweet corn has bright green, moist husks. The silk should be stiff, dark and moist. You should be able to feel individual kernels by pressing gently against the husk. As soon as corn is picked, its sugar begins is gradual conversion to starch, which reduces the corn's natural sweetness. Corn will lose 25% or more of its sugar within 25 hours after harvesting it. Fresh corn, if possible, should be cooked and served the day it is picked or purchased. ** Avocados - Test for ripeness by cradling an avocado gently in your hand. Ripe fruit will yield will be firm, yet will yield to gentle pressure. If pressing leaves a dent, the avocado is very ripe and suitable for mashing. They are best served at room temperature. *** To make chiffonade: Stack basil leaves, then cut across the stack to make small "ribbons." 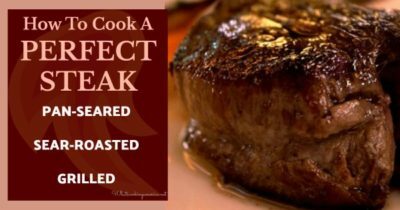 Light a barbecue grill or preheat a grill pan. Brush the corn lightly with olive oil and sprinkle with salt and pepper. Grill over moderately high heat until charred in spots but still slightly crisp, approximately 7 minutes. Learn How To Grill Corn On The Cob. In a large bowl, gently combine the corn kernels, cherry tomatoes, onion, avocado, and basil leaves; set aside. In a small bowl, mix together the Champagne vinegar, Dijon mustard, olive oil, salt, pepper, and red pepper; whisk until well blended. Taste and adjust salt and pepper, if necessary. Just before serving, toss salad ingredients with the Champagne Vinegar Dressing. Taste for seasonings and serve cold or at room temperature. Garnish with basil leaves.